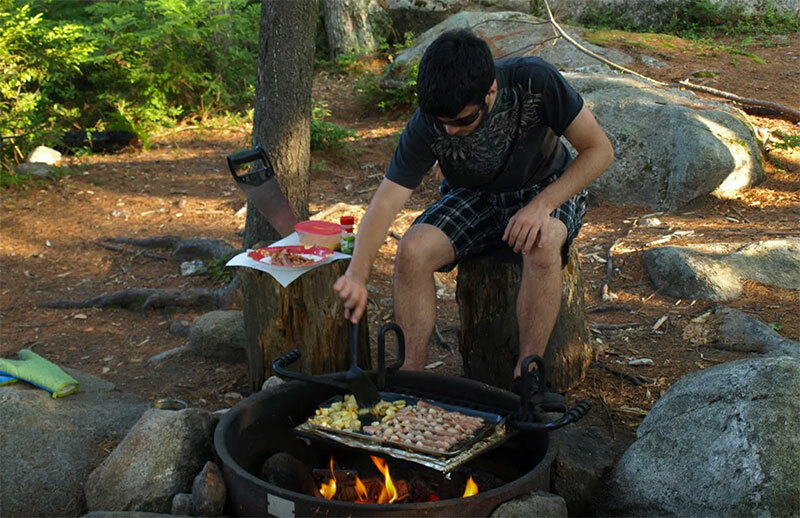 Group/ Remote Camping: 26 lean-to sites for group camping, 7 remote lean-to's, 1 remote tent site. Pets are not permitted on the beach but are allowed elsewhere throughout the park. Take a left onto US-302 west, go 8.7 miles. Turn right onto VT-232N. Travel 7.5 miles and Kettle Pond is on the left. Go 2 miles west on U.S. 302, then 7.5 miles NW on VT 232. Group/ Remote Camping: There are 26 lean-to's arranged into five separate groups. There are also 7 remote lean-to's and 1 remote tent site. Hiking: In addition to the Kettle Pond Trail, Groton State Forest offers over 17 miles of hiking trails. Swimming: There is a campers beach and lots of great swimming in Kettle Pond. Boating: Boats are welcome at the park. There are also 4 canoes available to rent at New Discovery State Park. Fishing: Rainbow trout, perch and small mouth bass can be found in Kettle Pond. Nature Programs: The Groton Nature Center is a short drive away. As early as 1704 Native Americans and the French were using routes through Groton to reach Canada and Massachusetts. Colonists settled this area of Vermont slightly earlier than the rest of the state due to the accessibility the network of waterways provided. The rocky, tree-covered hillsides were originally covered by white pine, spruce, hemlock, beech, maple and birch. They were logged by local farmers for lumber, fuel and potash. The logging industry was large scale for almost 100 years while the railroad was operating. Today, logging is still a vital industry in the area, but has lost some of its dominance in favor of modern society's leisure time movement: private cottages and seasonal homes, park development and a variety of outdoor recreation activities. The campground is located on the shores of Kettle Pond, an undeveloped pond. There are 26 lean-to's arranged into five separate groups designed to accommodate a variety of different groups and organizations such as scouts, churches, clubs or other social institutions. There are two composting toilets and two double pit toilets. There is no potable water at this site, but you can get water at nearby New Discovery State Park. There is a campers' beach and miles of hiking and multiple use trails in Groton State Forest. 7 remote lean-to’s and one remote tent platform are also available. Additionally, the Groton Nature Center is nearby and serves all the state parks in the Groton State Forest. Day use parking: Day use parking for hiking and boating is separate from the campground and is located adjacent to VT Route 232. The hiking trail and boat portage trail is located in the northwest corner of the parking near the kiosk.